We're a pretty even-tempered guy on most days, and when it comes to our fandom for the game of baseball, we generally take efforts not to enjoy the game with a pitchfork in one hand and a torch in the other. If we can maintain our aura of zen when Coco Cordero has a bad outing, we can probably maintain our composure in most circumstances. And when lapsed Blue Jays come to town after they've moved on to another team, we generally get annoyed with those who take it upon themselves to welcome those former favourites with a hearty round of boos. Those guys had their time here, and some of it was good, and then they moved on. We can't be mad at them forever, can we? But as we looked ahead to this weekend's series in Atlanta, the name that stuck out most for us was Eric Hinske. He's nothing more than a minor contributor for them, and it's been six years since he moved on from Toronto. But the sight of his name in a boxscore ignited something bilious in our gut. It's not right, is it? To keep on carrying some sort of grudge against him? What did he do that was so wrong? There were two somewhat minor knocks on Hinske after that first season. One was that he needed to improve against lefties, who held him to a .202 average versus his .301 mark against righties. The other was that he struck out too much, and that if he were to reach the next level, he's have to cut down on his 138 whiffs. Which is funny, because in an era in which Mark Reynolds has an everyday gig, that number of strikeouts seems rather quaint. Over the next few seasons, Hinske struck out marginally less and hit lefties better, but in the aggregate, he never improved on his power numbers, and his defense got bad enough that he'd be moved to first base for one year and right field for his last full season with the Jays. By the time that Hinske had a decently-productive-if-injury-plagued 2006 season (.865 OPS), he was seen as dead weight, with extra emphasis on the word "weight". At every stop along the way, he found himself in the middle of the postseason mix, winning two World Series (in 2007 with Boston and 2009 with the Yankees), plus an American League Pennant (2008 with the Rays), and one more appearance with the Braves in 2010. To which we were always left baffled. REALLY? Eric Freaking Hinske? That guy? HIM? He also hit five home runs in 42 games against the Jays, which doesn't seem like much on the surface, but they all stung like a stubbed toe. So why the high levels of antipathy? Maybe it is because we expected great things out of Eric Hinske from the very start. His acquisition was at the start of the J.P. Ricciardi era, and there was a notion that his great rookie season would set the tone for the great times ahead. He fell short for a variety of reasons, including some injuries to his wrist and hands, and the devolution of his body from an athlete's tool to one that too closely resembled our own. When he failed to deliver as those teams began to sputter and underperform, it seemed like his failures were emblematic of the entire, overwhelming sense of frustration. 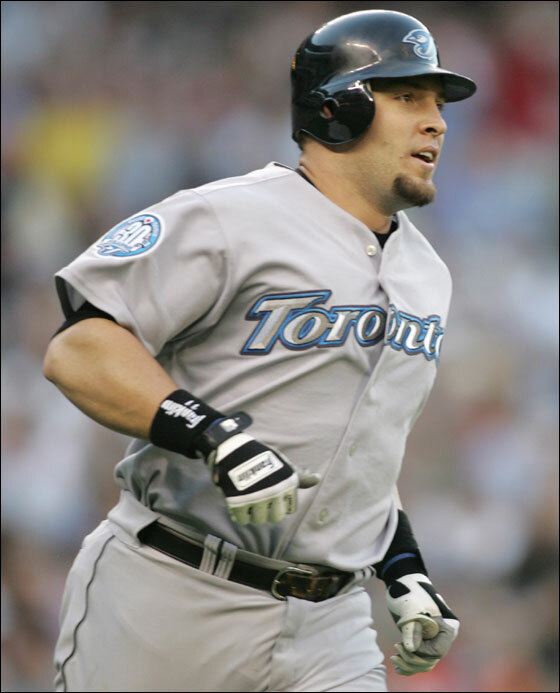 We should probably be a lot more conciliatory towards Hinske, respecting the fact that he wasn't terrible for the Jays (.774 OPS for his career in Toronto), and we should likely be happy that he's carved out a nice little niche for himself as a utility guy and pinch hitter. We dislike the tendency among Toronto sports fans to seek out whipping boys, so why should we indulge in the same? And yet, when that stupid crew cut and goofy chin scruff show up on our TV screen this weekend, we're pretty positive that we'll toss a few coarse words in his direction. Should he get a big hit, the vulgarity will certainly spew out colourfully and in quantities. We know that it might not be right, but we'll feel better for getting those frustrations out. Don't be sorry. Screw that guy. And Roy Halladay too, when I'm having a bad day. Nothing compares to the vulgarities I spew when I even see or hear anything on Alexis Rios.